BeachCare is a coastal community engagement initiative facilitated by Griffith Centre for Coastal Management in partnership with the City of Gold Coast. The program provides an opportunity for community members to help care for their local coastal environments through the planting of native dune species, weed removal and litter collection and auditing. The BeachCare program works to conserve the city’s biodiversity and protect coastal vegetation on public land. More importantly, the program empowers communities with skills, experience and information. 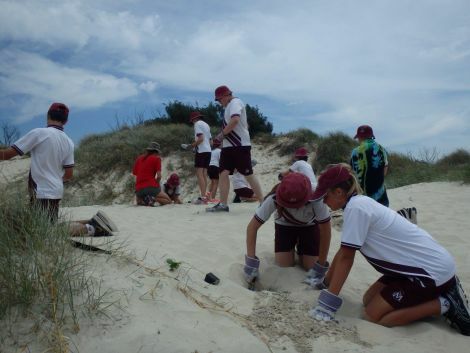 This supports locals to respond independently and create sustainable community values for the coast through increasing awareness and caring for our Gold Coast dunes and their fragile ecosystem. We have more than 10 dedicated BeachCare sites spanning the Gold Coast’s vast shoreline, from Currumbin in the south to Paradise Point in the north. See our list of sites to find your closest point and get involved! Check our calendar to see when we’ll be active in your area. Connect with us on facebook for events that are coming up soon. We welcome new volunteers who wish to join the many who dedicate time and energy to help care for our treasured beach assets. If you are attending a BeachCare activity, please bring a bottle of water and wear enclosed shoes plus sun-smart clothing. BeachCare would like to thank the City of Gold Coast, Landcare Australia, the Gold Coast Airport Community Benefit Fund, Eco Technology Solutions, Sea World Research and Rescue Foundation, Healthy Waterways and Catchments, and City of Gold Coast Councillors Boulton, Young, McDonald and O'Neill for their generous support in 2016 and DBI Design Surfers Paradise for their donations in 2017.